FILE - This photo shows the launch of the U.S. military's land-based Aegis missile defense testing system, that later intercepted an intermediate range ballistic missile, from the Pacific Missile Range Facility on the island of Kauai in Hawaii, Dec. 10, 2018. The Trump administration will roll out a new strategy for a more aggressive space-based missile defense system to protect against existing threats from North Korea and Iran and counter advanced weapon systems being developed by Russia and China. Details about the administration’s Missile Defense Review — the first compiled since 2010 — are expected to be released during President Donald Trump’s visit to the Pentagon with top members of his administration. 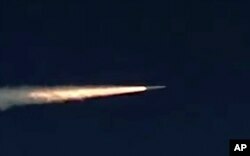 FILE - Photo made from footage taken from Russian Defense Ministry official web site on March 11, 2018 shows the Kinzhal hypersonic missile flying during a test in southern Russia. Congress, which ordered this review, has directed the Pentagon to push harder on this “boost-phase” approach, but officials want to study the feasibility of the idea and explore ways it could be done. For example, Russian President Vladimir Putin unveiled new strategic weapons he claims can’t be intercepted. One is a hypersonic glide vehicle, which could fly 20 times faster than the speed of sound and make sharp maneuvers to avoid being detected by missile defense systems. Asked about the implications for Trump’s efforts to improve relations with Russia and strike better trade relations with China, the administration official said that the U.S. defense capabilities are purely defensive and that the U.S. has been very upfront with Moscow and Beijing about its missile defense posture. 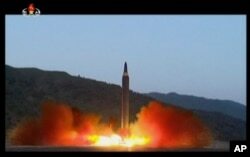 This image made from video of a news bulletin aired by North Korea's KRT on May 15, 2017, shows what was said to be the launch of the Hwasong-12 missile at an undisclosed location in North Korea.